It is a new Kansas City icon. 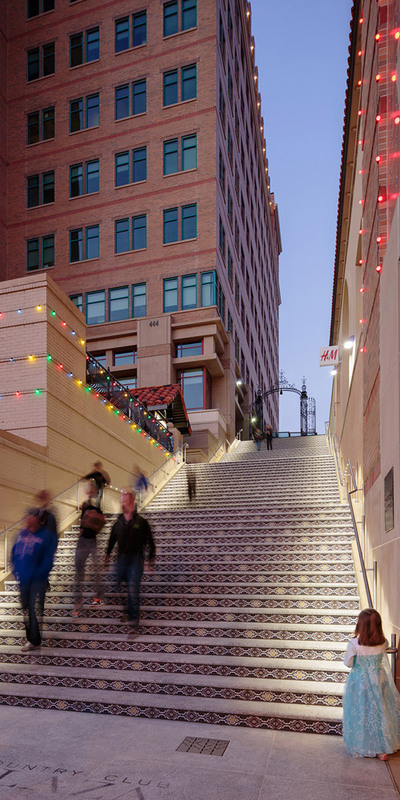 Even though Valencia Place has only been open for 15 years, the stair (or escalera) leading up from 47th Street to McCormick and Schmick’s Restaurant and on up to the office tower has become a favorite spot for engagement photos, climbing toddlers, fitness fanatics and just as a spot to take a break on a warm day. 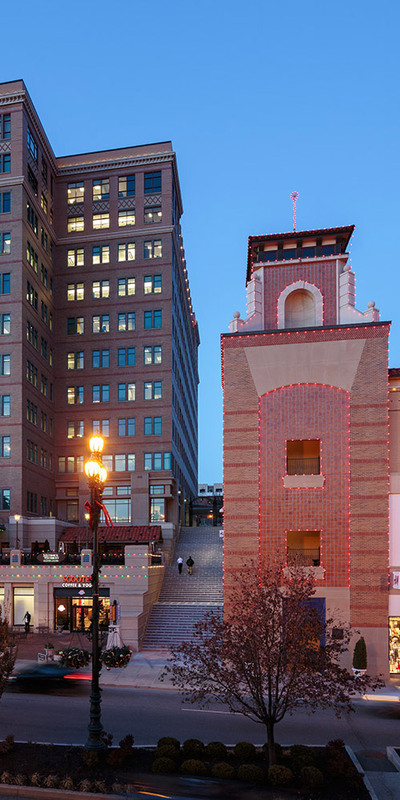 Unfortunately, this iconic feature of the Country Club Plaza had suffered from water infiltration over the years, causing rapid deterioration of the surface materials. Selective investigation revealed the structural slab appeared to be in good condition, but the waterproofing membrane was at the end of its effective life. The topping slab was starting to show signs of deterioration. If left alone, the structural slab would eventually be compromised, resulting in a much larger problem. The magnitude of the stairs also meant it was very difficult to remove snow and maintain in inclement weather. For safety, maintenance personnel would apply salts and other chemicals to keep ice off the stairs. The addition of these chemicals also contributed to the rapid deterioration. The design team was tasked with three goals: 1) Improve safety; 2) Stop the water infiltration and 3) Improve the appearance. This was not just a cosmetic fix. It quickly became apparent this would be a major undertaking requiring a complete redesign of the stair system. One significant issue was the intersection of so many different materials into the stair. With the surrounding walls finished with stepping brick veneer, tile surfaces, cast stone and plaster, there were several unique connections to review. These surfaces, when interfacing with the stair treads and risers, allowed numerous locations for water infiltration where seals were difficult to maintain. The solution was a colorized concrete curb to frame the stair and create a consistent, even surface to intersect the numerous unique materials. The selection of materials was also important to satisfy all three goals. The cast stone on the stair treads had deteriorated to the point where the material could be crushed by hand. The treads would hold moisture, allowing it to seep behind the tile risers and into any available opening. The new treads would need to be highly resistant to moisture and long-lasting under harsh conditions, so granite was the only choice. In addition, a glycol snow melt system was incorporated into the topping slab to enhance safety, ease maintenance and prolong the life of the materials. Since snow and ice are prevented from collecting on the surfaces, snow removal and application of chemicals are no longer necessary. Even in the worst weather, the surface temperature of the granite treads remains just over 40 degrees Fahrenheit. To further enhance safety, an illuminated handrail was chosen. With individual LED lights let into the bottom of the stainless steel rail, the system is fully enclosed and offers enhanced lighting at the walking paths along the rails. All of these features work behind the scenes to enhance safety and make the Valencia Place Escalera a long-lasting component of the Plaza. However, the most visible and most memorable feature has always been the decorative tile risers creating a splash of color and visual excitement as the pattern is revealed over the whole of the stair. The spirit of that highly photogenic background was enhanced through the use of a clay body, frost-proof, hand-painted, Spanish patterned tile. The tiles were custom made to 12” wide to minimize the number of joints to maintain. 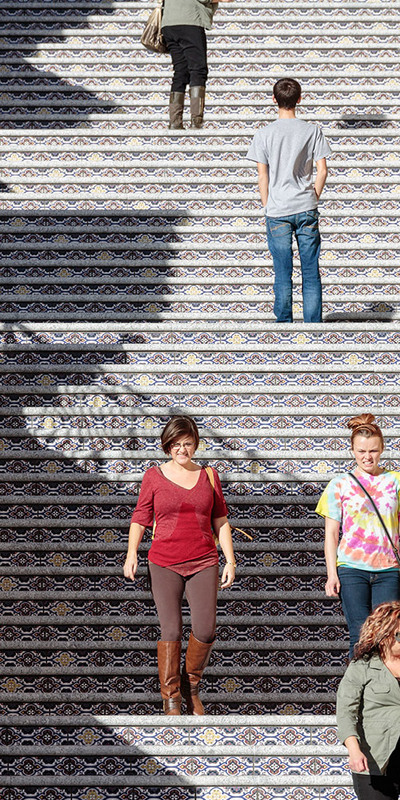 The pattern introduces new vibrant colors to the stair while keeping a pattern reflective of the original. The design team approached this project knowing that the artistic had to marry with the practical. The solutions are attractive while satisfying very real needs for safety, durability and longevity. Creative solutions for difficult conditions is a hallmark of GastingerWalker&. Teamed with Structural Engineering Associates, Inc. and WL Cassell & Associates, we worked collaboratively to develop the best solution for this completely unique project.